NAIROBI, Kenya, Sep 26 – 2004 Nobel Peace prize winner and environmentalist Wangari Maathai has died while undergoing treatment at the Nairobi Hospital. Prof Maathai succumbed to ovarian cancer at 11pm on Sunday night, just over a year since she was diagnosed with cancer, in July 2010. The 71-year-old political activist is well known for her constant battles with government to protect Kenya’s forests. By Ozolua Uhakheme, Assistant Editor (Arts) for The Nation. 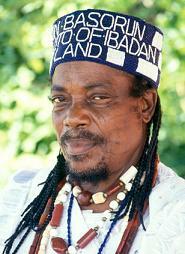 Born: 1944 in Ogidi, Nigeria. A multidimensional artist, singer, musician, actor, writer and poet, Twins Seven-Seven, one of the greatest artists of the Osogbo School, has died at aged 67. He passed on yesterday at the University College Hospital, Ibadan, where he had been on admission following a stroke. The artist, real name Olaniyi Osuntoki was one of the most famous products of Ulli Beier's experimental art workshops, held in Osogbo in the 1960s. Professor Ekpo Okpo, OFR, PhD, eminent archaeologist, anthropologist, passed away on the evening of Saturday, 28 May 2011, in Maryland, USA. Professor Eyo was 80 years old. He is survived by, his wife Augusta, two sons, daughters-in-law, and grandchildren. A great tree has fallen. The family of Ekpo Eyo, emiment archaeologist, professor and museologist, requested that colleagues be informed of his passing. Professor Eyo was awarded ACASA's leadership award in 2004. Emails of condolences to his wife Augusta, his son, Etim, and daughter-in-law Medupe, can be posted on the site and I will forward them to the family. His funeral service is still being planned. It was on a Valentine´s day that Layori discovered her love – her love for great performances. She stood on the stage of the “Mayflower School”-auditorium in her domestic Nigeria to sing for three thousand of her fellow students and their relatives. “It was just overwhelming. It felt totally natural for me to stand up there on stage und perform.”She had trained her voice from her early childhood on, but she found out in that very moment that music would play the leading role in her life from now on.